I swear, we have that very one. To get the whole yard, we need 3 extension cords. Go back to using your teeth. It works better than killing the town with a weed whacker. Or get a horse. sheep. a small flock would do just as well. and their manuer isn’t as big as a horse’s. Sheep need to be sheared, though. 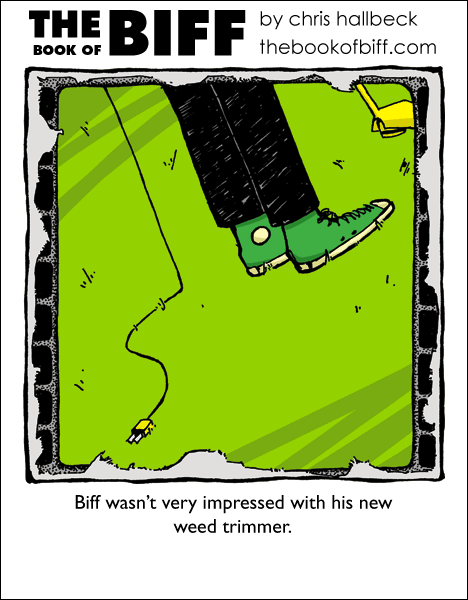 Give Biff a shearer and he’ll slice a good few limbs off. My suggestion: Get a goat. I have a goat his names eric. Darkpheonix, it wasn’t over a bottle of Mountain Dew, was it? I can see myself doing the exact same thing. The last time I tried to use one of those, I wound up sending splinters flying into my bare legs at 30 mph. Wait is Biff unimpressed because of how short the cord is or is he unimpressed because it’s not working (since it isn’t plugged in)? @Zero: This is Biff, can’t it be both? My electric weedeater doesn’t even HAVE a cord.